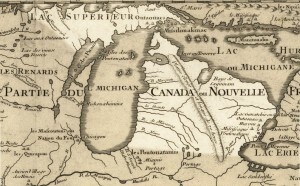 The French enjoyed the support of most of the Aboriginal nations in the Ohio, Great Lakes, Mississippi, and Illinois territories for several reasons. They did not demand concessions of land, they arrived as (and generally behaved as) guests, they regularly and systematically gave gifts of various kinds to maintain alliances, and they engaged in a fur trade that was lucrative for most of the Aboriginal participants. However, the French record in the Pays d’en Haut was not unblemished. Figure 4.19 Detail from a map of the Pays d’en Haut in 1718. The Meskwaki and their allies, the Mascouten and the Kickapoo controlled much of the rivers system to the south and west of Lake Michigan. From about 1700 the French were at odds with the Meskwaki (a.k.a. Fox) who controlled the river corridor that connects Lake Michigan to the upper Mississippi valley. The Meskwaki sought to hold their position as intermediaries in trade between the Council of Three Fires (the Potawatomi, Ottawa, and Anishinaabe/Ojibwa) and their French partners and the Sioux nations to the west. The Meskwaki had little reason to love the French; it is likely that the Wendat — armed by the French — displaced them from southern Ontario in the early 17th century. The French, for their part, wanted unfettered access to the Sioux and the Plains. The Meskwaki held certain advantages at the beginning of the conflict but the tide quickly turned badly against them. Only a few hundred Meskwaki survived the Fox Wars. It is important to note that, whatever Beauharnois might have wanted, it could not come to pass without the support of the Aboriginal allies. What this grim campaign in the Pays d’en Haut reveals is complex. First, it puts the lie to the myth of unqualified positive relations between the French and their Aboriginal neighbours. The French may not have been interested in annexing lands but they were as driven by greed and pride as any other peoples. Second, the Fox Wars were a test of the strength of French diplomacy among their allies. A test that the French passed utterly. Third, and to build on that last point, the influence of European goods, commerce, and military alliances was having far-flung impacts across the middle of North America, and not only in Canada, Acadia, or the Mississippi Delta. Generally the position of the French was strong. The same could not be said of the Virginian colonists who at this time decided to explore the possibility of expanding across the Appalachian Mountains and into the Ohio Valley. The Pays d’en Haut was a critical bridge between the two larger French settlement colonies. The Fox Wars constituted a test of the ability of the French to secure their goals among Aboriginal communities. The French were, with the support of their allies, able to inflict significant losses on enemies located thousands of kilometres away from Canada and Louisiana. 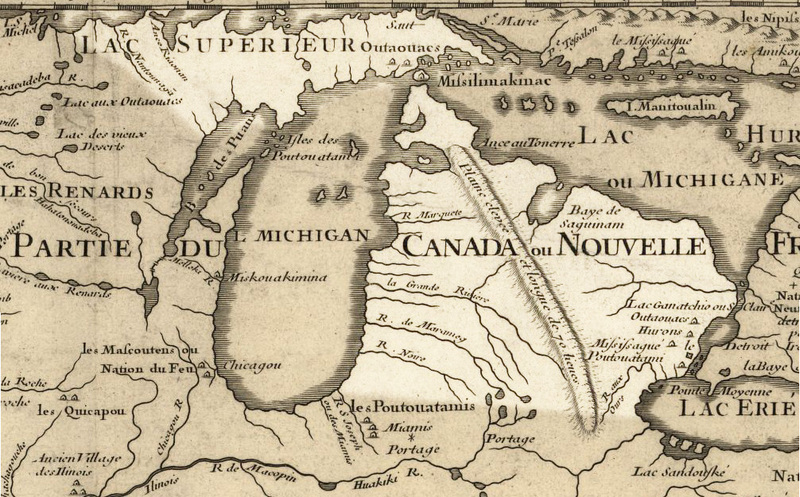 Michigan 1718 by Jeangagnon is in the public domain. 4.9 War in the Pays d'en Haut by John Douglas Belshaw is licensed under a Creative Commons Attribution 4.0 International License, except where otherwise noted.